What goes best with pizza? You can find The Rock-afire Explosion covering many of your favorite songs on youtube. Whiskey is certainly no stranger as an ingredient in barbecue sauce. Shoot, as anyone who's ever visited the gift shops in Lynchburg knows, Whiskey is no stranger in any number of food products. But rarely is it featured as prominently as it is here. 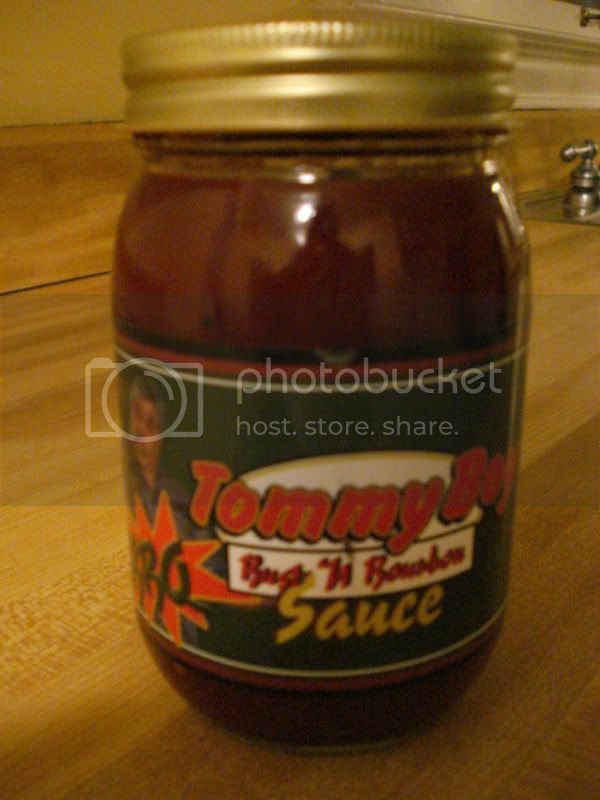 This is upstart Berry Hill eatery Tommy Boy Sausage Company's signature sauce - Bust 'n Bourbon BBQ Sauce. Used properly, bourbon can certainly be a tasty condiment component. In this case, I can't make up my mind whether its application may be a bit heavyhanded for a barbecue sauce. The smoky sweet essence of the bourbon is the first thing you smell when you open the jar, and it's the first thing you taste as well. The consistency of the sauce is medium, lightly coating a spoon. There are visible bits of spice suspended in the sauce. In addition to the bourbon flavor, there are notes of onion, apple and citrus. Bottom line: as an all-purpose barbecue sauce, this probably isn't what you're looking for, but for certain applications, it just might work. So the results are in for the Tennessean's inaugural "Toast of Music City" awards, and wow...what a trainwreck. I'm sure when the powers that be down at 1100 Broadway dreamed up these awards, they could not have envisioned how laughable the final results would be. Ladies and gentlemen, the winner for best restaurant in Nashville is........Bar-B-Cutie! That's right, Bar-B-Cutie. And keep in mind, this was not just for best barbecue restaurant, but for best restaurant overall, across all categories! Jeremy Barlow, Jason Brumm, Andrew Chadwick: thanks for playing, but you have just been defeated by a third tier barbecue chain. The abominations abound - Las Palmas for best Mexican, Chaffin's Barn for best buffet, Stoney River for best steak, and on and on. But I think my personal favorite is the "Best Hot Chicken" category. 1st place - Bojangles, 2nd place - Popeye's, 3rd place - Otter's Chicken Tenders. LOL!!!! So I'm trying to figure out if there was some kind of ballot box stuffing that took place, or if the Tennessean's readership really is that devoid of good taste. I think that a lot of intelligent, well-rounded people still do read the newspaper. But as anyone who has cruised the comment sections of online articles knows, the internet readers/commenters are a different breed. There are some frighteningly ignorant people knocking around in there. But I digress. So anyway, the barbecue top three: 1st - Bar-B-Cutie, 2nd - Famous Dave's, 3rd - Jack's. Given that this was a reader's poll, I am pretty surprised to see Whitt's absent from that list, considering they have topped the Nashville Scene's reader's poll for about 74 years in a row. Suffice it to say, if the Toast of Nashville is back next year, I think it will be considerably tweaked. This weekend some friends brought by some fresh veggies from their garden. 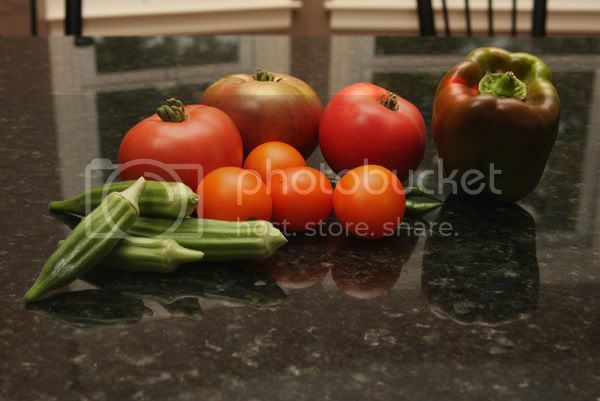 Just as I am nuts about bbq, my friend Patrick is nuts for tomatoes and other veggies. These tomatoes are the real deal, from black tomatoes to the Arkansas traveler, he grows them all. You can see he also brought me some okra and some Thai hot chillies for some stir fry. I smoked a turkey breast on the Egg and sliced it up for some sandwich meat. 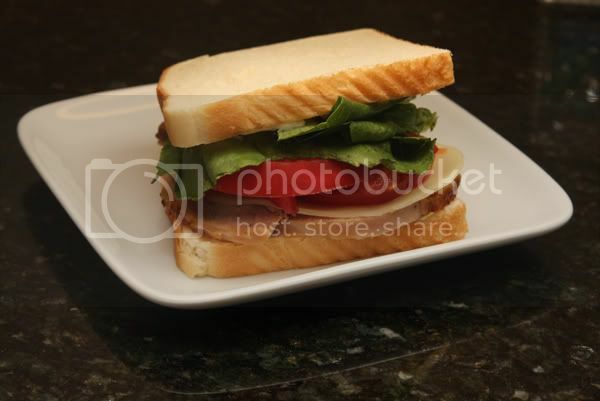 There is nothing like some smoked turkey, mayo, provolone cheese, home grown tomatoes, lettuce, and some freshly cracked black pepper. 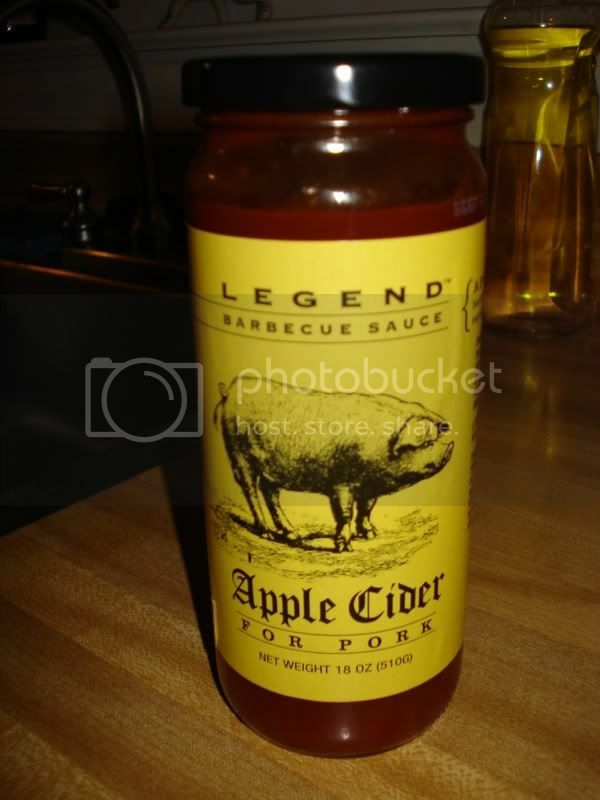 "Legend" is a line of barbecue sauces produced and marketed by a company called Seasons Harvest. Barbecue sauce is but one part of a diverse lineup of condiments and accoutrements which seem to be aimed squarely at the foodie crowd. This particular sauce is recommended specifically for pork (there are other sauces for beef, fowl, and seafood). Upon uncapping, one can immediately smell the apples - it smells kind of like you just opened a jar of apple butter, in fact. The sauce is fairly bright in color and fairly thick in consistency, with a puree texture containing no bits floating within. And as strong as the sauce smells of apples, it tastes even moreso. It's very sweet, bursting with the taste of fresh apples. Mike Mills, I do believe you've been out-apple'd. There are hints of onion and tomato that keep it from simply tasting like applesauce. There is no apparent spiciness at all. Okay, but how good is it? It does have a pleasantly fresh and natural taste, but...very fruity. I tend to think it might go better with something like grilled pork chops, rather than barbecue. Whether it be a county fair, a Broadway show or your favorite rock concert, there is always someone working hard behind the scenes. 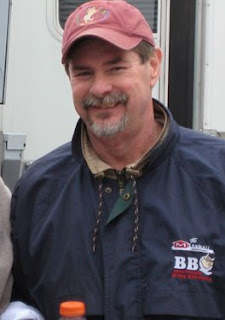 At a KCBS competition, it is the contest organizer and the KCBS representatives that make the event possible. Since team Ulika has been competing, there has been one contest rep that has stood out among the rest. That person is Ron Harwell. Q: Ron, tell us about how you got started in barbecue. Did you first get into it as a cook, or just a barbecue enthusiast? A: When that old Char-Broil grill rusted out for the second time, it was beyond repair. So I went down to a local barbecue supply store and purchased an Oklahoma Joe's backyard smoker (even got to meet and know Joe Don Davidson later on). However, I QUICKLY learned that even though I could grill a mean steak, I had a lot to learn about smoking anything. About that time, a meat hook I ordered came wrapped in a BULLSHEET and the rest is history. Although I never have aspirations of being a competition cook, I always wanted to offer family and friends the best product possible. Q: How did you move from a casual interest in barbecue to such a committed involvement? A: The more I learned, the more I found out that either I didn't know or that I needed to know. In those early days, most Pit Bosses were glad to have someone stop by their cooksite after midnight on Friday evening to chat with. You could usually pick up several tid-bits from almost everyone you talked with. Q: Tell us about some of the people within the barbecue community who have been mentors, or have been instrumental in guiding you to where you are today. A: Over the years, I've been priviliged to know Paul Kirk, Bob Zaban, Gary Wells, David Klose, Ardie Davis, Johnny Trigg and MANY, MANY others. Each of them have contributed to my "backyard" knowledge and skill. Q: What attracted you to KCBS as opposed to other sanctioning organizations? A: Getting that BULLSHEET early-on really helped. And every time I called the KCBS office for suggestions or assistance, they were quick to put me in contact with experienced Cooks who could answer my questions on my level. Q: Do you cook barbecue on a regular basis? What kind of equipment do you use? A: The following pits are currently in my backyard arsenal: a Sporty Porkers Backyard Smoker, a large Guidry Grill, a Stump's GF-223 (clone) and a large Primo oval smoker. Usually one of these is fired up on a weekly basis. Q: Do you consider cooking barbecue to be an art or a science? A: IMHO, barbecue cooking is an art (but then, what came first, the chicken or the egg??? -- opinions vary, you know). Q: You spend a lot of time at barbecue-related events. Do you ever get sick of barbecue? A: When I get tired of barbecue, I guess I'll stay home and watch soap operas. However, I DO NOT look for that to happen anytime soon. Besides, I continue to make new friends at almost every contest I attend. One thing though, I usually eat veggies for several days after returning home from each competition. Q: What do you do in your leisure time besides repping barbecue contests? A: I usually have at least one of those smokers fired up for family or friends (i.e., always trying to improve). Q: What is your favorite part of your role within KCBS? A: Working with new Contest Organizers and/or new or beginning Cooks, then seeing that contest grow or a new team get their name called on Saturday afternoon -- it's a wonderful sense of accomplishment!!! Q: What is your least favorite part? A: NO QUESTION -- having to face a Pit Boss to tell them their entry was DQed -- MAJOR BUMMER!!! Also, Contest Reps no longer being able to enjoy an adult beverage with friends on-site after their duties are completed on Friday evening (which is why I choose to rendezvous with friends off-site at most contests). Q: Do you have a favorite contest? Which contests do you really look forward to each year? A: EVERY contest I do is one of my favorite contests. Q: What is the most memorable contest that you've ever been a part of? A: The 19th Jack Daniel's because I was asked by Carolyn Wells to say a prayer remembering our dear friend Gary Wells as she sprinkled his ashes in the stream next to the J.D. Visitor's Center. Quite an experience!!! Q: What is your personal favorite meat category? 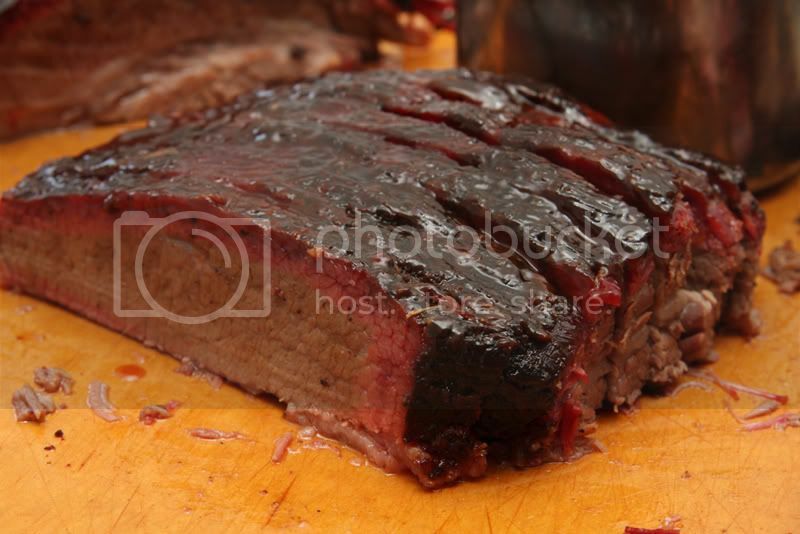 A: Believe it or not, I had never tasted brisket until I attended the Spring Training event held at Dan Haak's place in Bucyrus, KS back in 1992 -- now brisket my favorite category. Q: What was the topic of your Ph.B. Dissertation? A: I think it was "What can I do to leave the barbecue arena a little better than I found it." In addition, my dissertation also included a detailed history of barbecue beginning with the caveman and progressing forward to current times. Q: Tell us about some of your favorite barbecue restaurants. A: Locally, B.B Perrins, The Bar-B-Q Smokehouse and Big Bob Gibson's. Also the original Dreamland BBQ in Tuscaloosa, AL and Archibald's in Northport. YUMMY!!! Q: What is your favorite beverage to accompany barbecue? A: Ice cold brewski's -- of course. Q: How many games will Alabama win this year, Ron? A: In 2008, the Crimson Tide could be undefeated -- but who, cares as long as we beat LSU, Tennessee and Auburn!!! ROLL TIDE!!! Thanks to Ron for taking the time to answer our questions. We'll see you on the BBQ trail again soon! It's no secret that I'm a Blues Hog fan. Blues Hog Original is as good as any barbecue sauce I've ever tasted. Blues Hog Tennessee Red ain't so bad either. 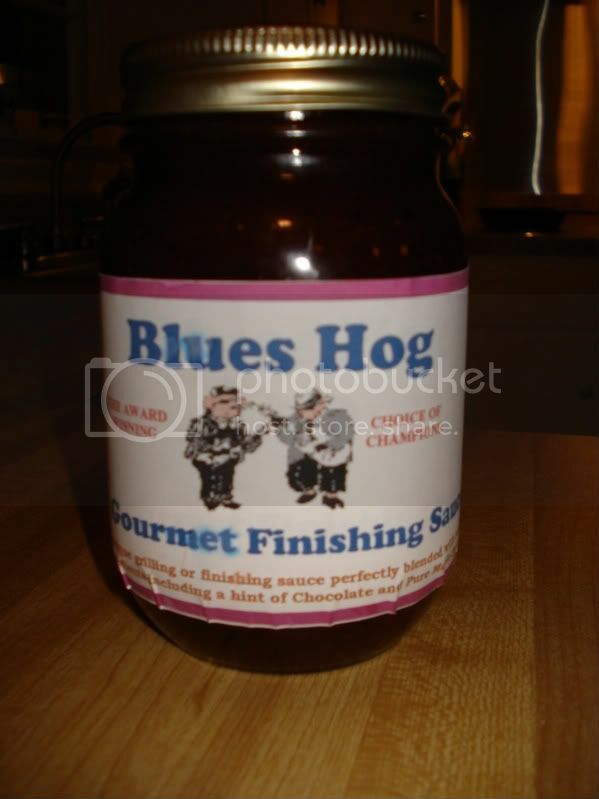 So imagine my enthusiasm when I learned about...Blues Hog Gourmet Finishing Sauce! Gourmet Finishing Sauce? Shoot, 'ol Bill has gone and gotten highfalutin on us! The sauce smells and looks almost exactly like BH Original. The finishing sauce may be just a little bit more viscous, if that's possible. And upon first taste, the finishing sauce tastes very similar, too. But after the first second or two, this new product differentiates itself. First of all, the tamarind flavor seems to be more pronounced, giving this sauce a subtle sour component to balance the extreme sweetness. There also seems to be a salty, savory flavor which swells as the sauce lingers, yielding a certain richness. Is it anchovies? I cannot detect any of the chocolate or real maple syrup, which the label claims are key ingredients, but that doesn't stop this finishing sauce from having that characteristic Blues Hog sweetness. One final aspect that makes this sauce different is the lingering mild burn left on the palate. Overall, for me personally, this sauce falls a bit short of the greatness of Blues Hog's existing product line. It is very sililar to the original barbecue sauce, which is a good thing, but the small differences do not strike me as improvements, but rather detriments. To me, the sour and savory elements only distract from what was an already great sauce. But the reality is that Blues Hog's worst sauce is still better than many companies' best. Get well soon, Bill, and we hope to see you at a contest really soon! The best peaches I've ever eaten can be found this time of year at assorted fruit stands just off of I-65 in Chilton County, Alabama. 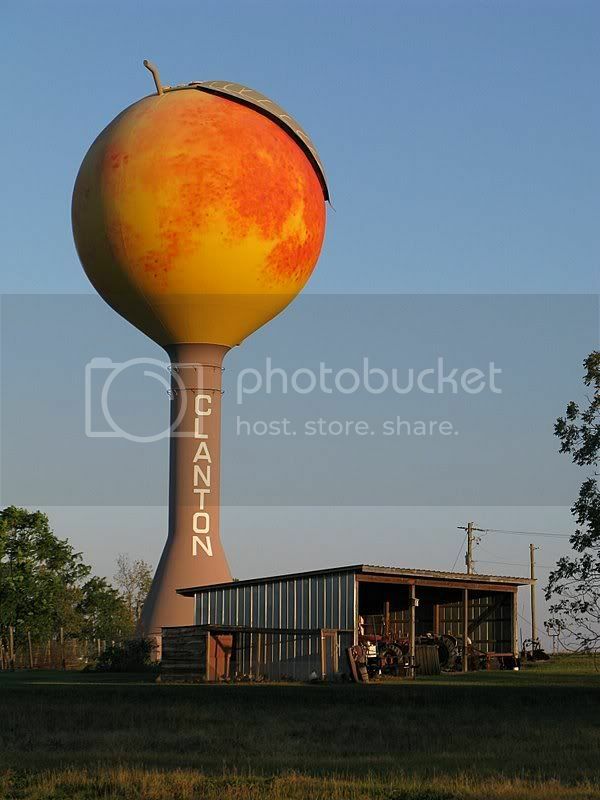 Look for the giant peach watertower. 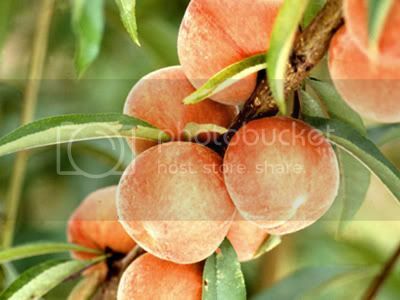 "This towering testament to the fruit that makes the region famous means two things: First, you're slap in the middle of Alabama's peach country; and second, you better take a nearby exit if you want the freshest and the sweetest." Start with your favorite pie crust recipe. Ours is a basic butter crust with a little sugar added and cream cheese used in place of the shortening. For a smaller pie/cobbler, you'll just need one crust; for a full-size pie, you'll need to make enough dough for two crusts. Press half of the dough into your baking dish reserving the other half for the top. Wash, peel and thinly slice your soft, ripe peaches (about 6 to 8 for a small cobbler, 12 to 14 for a pie). Place the slices in a large saucepan over medium-low heat and add sugar and spices to taste. For a full-sized pie, start with about 1 cup of sugar, 1/4 cup of brown sugar, a few light shakes of nutmeg and few heavy shakes of cinnamon. Cook the mixture just until the sugar is all melted and evenly mixed and the peaches are soft and squishy. Remove the mixture from the heat and stir in about 1/4 cup of flour and a tablespoon of corn starch. Pour the mixture into the pie crust, dotting with a little butter along the way. Use the remaining pie crust dough to cover the pie - making a top crust with slits, a lattice top, cut shapes, etc. 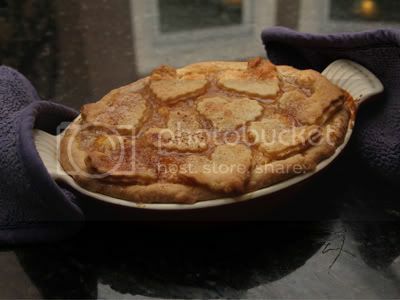 - and bake the pie at 425-degrees for about 35 to 40 minutes. The pie is done when the crust is a light brown and the insides are bubbly. 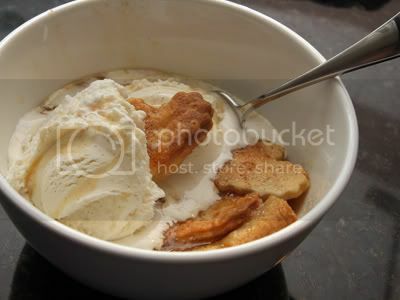 Then of course, serve it over vanilla ice cream. The year was 1991. U.S. was in the midst of Desert Storm, Exxon had a nasty spill to clean up in Alaska and Rodney King asked everyone to get along. Pee Wee was arrested (as was Mike Tyson) and Super Nintendo was released. The Giants won the Super Bowl while Michael Jordan led the Bulls to their first NBA Championship. The members of the Ulika BBQ team were 10, 11 and 12 years old. As kids of the 90s, Summertime was an anthem. This was on the radio while I was going to Little League and filling up on Fla-Vor-Ice, Fun Dip and extra large Pixy Stix. Before Will Smith was a drunk superhero, before he am legend, before Men in Black I and (unforunately) II, before Ali and Wild Wild West and even before the days of Gettin' Jiggy (Piggy) wit it...he was the Fresh Prince. By the way, have you often found yourself lying awake at night wondering where did DJ Jazzy Jeff go? Umm, nowhere I guess. While Will Smith moved on to make millions, it appears Jeff's still jazzy (and still name-dropping to keep food on the table - check out "Brand New Funk 2K7"). It was announced today that the 2009 Annual KCBS Banquet will be held in Nashville, TN. This marks the first time that the banquet will be held outside of Kansas City, and I for one am glad they picked Music City. The exact location of the banquet was not announced, but I assume it will be out at Opryland or a hotel near the airport. With a name like "Demon Pig", one would expect a real flamethrower of a sauce, but to my surprise, this sauce was not spicy at all. The first thing I noticed about this sauce when I poured it was that there are big chunks of stuff in it. Closer inspection revealed the chunks to be onion and bell pepper. I don't necessarily have a problem with chunks. In this case, the onions factor very prominently in the flavor of the sauce, so watch out onion-haters. The other major flavor component is brown sugar sweetness - this sauce is very, very sweet. And while the sweetness and the onion dominate things, there is a nice depth and well-roundedness provided by bit players garlic, vinegar and tomato. Yeah, the label tells me it has high fructose corn syrup in it. And liquid smoke. So it might not make the cut at Whole Foods. Does that make the Demon Pig a guilty pleasure? Eh, who cares? The bottom line with barbecue sauce, as far as I'm concerned, is "does it taste good?". And the answer in this case is: absolutely. 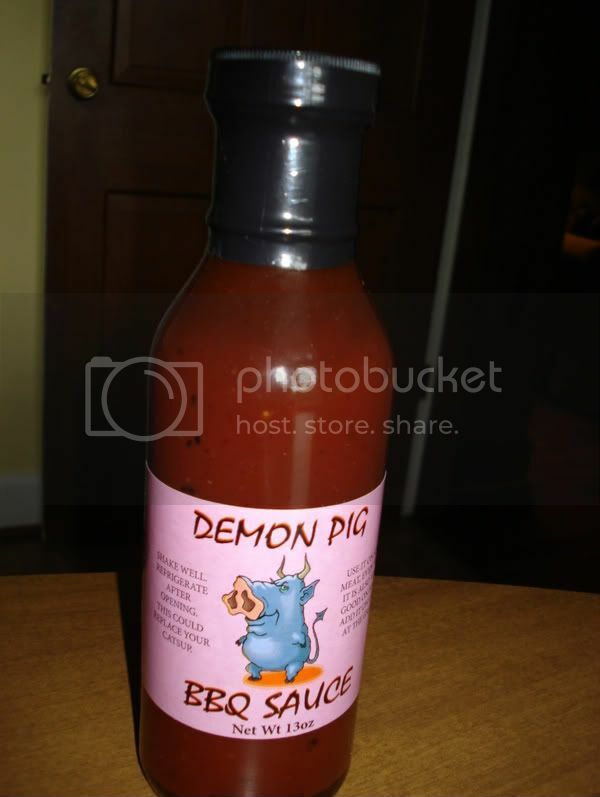 UPDATE: It has been brought to our attention that there was a misprint regarding the ingredients on the Demon Pig label. 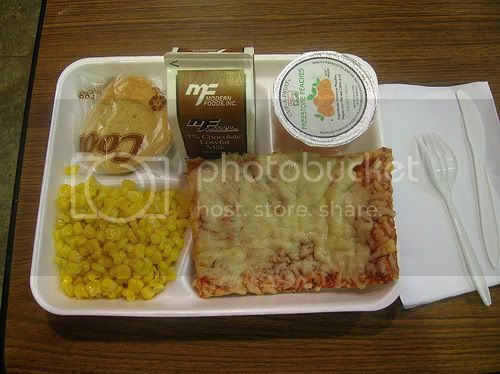 The sauce does NOT in fact contain High Fructose Corn Syrup, but rather the much more benign sorghum. Apparently, future label printings will correct this error. So there you go...tastes great, and all natural taboot. Hot Chicken Festival Report: Poultry's Popular! 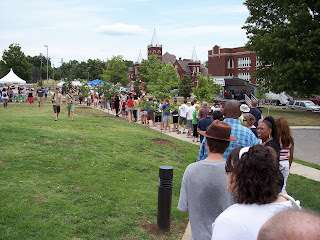 From Eric and Katie's Nashville Restaurants blog comes a review of Friday's Hot Chicken Festival. It looks like, despite having more vendors, this year's festival still drew a bigger crowd than it could handle. And though waiting in long lines is annoying, I think we would all agree that it's better to have this problem than to have the problem of not enough people showing up. Hopefully the crowds and long lines will send the message that this festival is something that our city is embracing, and the result will be an even bigger, higher profile event next year. One of the few culinary traditions that my family has is that we always make homemade ice cream on the 4th of July. Usually we're at my grandparents' house; this year we're at the lake, but we always use the same recipe. I'm told my great-grandparents developed this very basic recipe sometime in the 1920s. I think it's pretty good, but then again, I haven't tasted a lot of homemade ice cream. It can be easily modified from vanilla to other flavors by removing most of the vanilla and adding in other things. We have experimented with that over the years, but for today, here is the recipe for vanilla. Mix all ingredients together. Crank away. This Ulika Music Thursday selection has been chosen for you by the team's youngest member, JoJo Marlow. Only babies born in this millennium get the pleasure of having their mothers sing them to sleep whilst singing along with songs from an iTunes playlist coming out of the computer speakers. Of the many varied artists in JoJo's mother's library, we've found that there is one consistent artist that soothes...Bob Marley. Come on and cool me down, baby, when I'm hot. When you show and stir your pot. If you are looking for something to do on July 4th, check out Nashville's Second Annual Hot Chicken Festival. The festival will have hot chicken being served by local hot chicken shacks and will include an amateur hot chicken cooking competition. Next year BP and I plan on entering the contest. We still need a year to perfect our Ulika Hot Chicken. 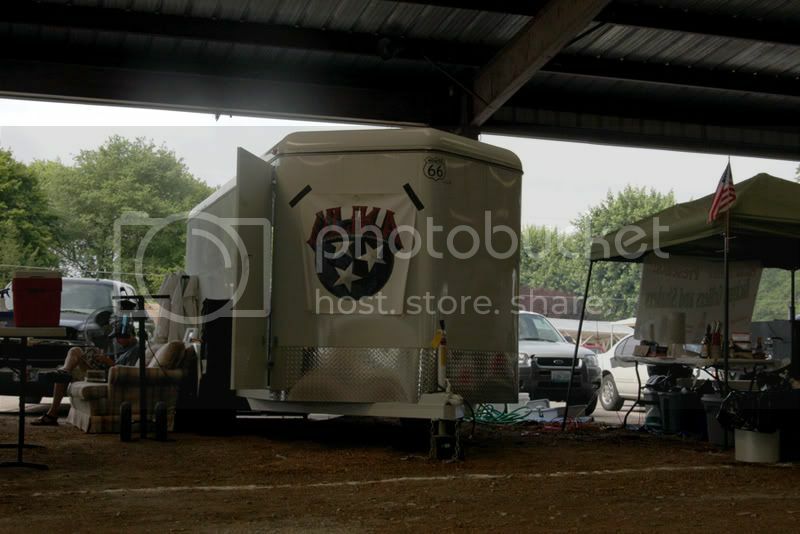 This last weekend we participated in the AT&T State Championship Cook-off in Lawrenceburg, TN. This event has now become one of our favorite places to cook. We were able to get a nice shaded spot underneath a pavilion that made the 90 degree heat bearable. Peter and I arrived at the site on Friday morning, got the trailer parked and prepped our big meats. Once everything was setup, I wondered around the grounds until the cooks meeting. Soon after the meeting was over we put on our butts and brisket for the overnight cook. In years past this would have been a start to a long night, but with the Stumps, we just let it roll as we sat back and relaxed. It had been a while since I cooked on the Egg, so I grilled a whole tri-tip for BP, Peter and I to enjoy for dinner. Later on I caught some sleep on our now infamous couch. That's right, we take a full size couch to competitions. It is something that BP started at our home town contest in Nashville last year, and he has been bringing it ever since. It is sure to get plenty of comments at every contest we attend. The morning started out great and we were not rushed at all getting our boxes together. This was probably the smoothest turn in that we have ever had. I think that we have finally developed a system that works and it made for lower stress levels at our site. Once everything was turned in, we packed up and awaited the awards ceremony. For the second contest in a row our brisket took fourth place. That makes four calls in four contests for our brisket this year. However, we are still chasing that first place brisket. Now if I could just get that consistent in the other categories we would be doing pretty good. The biggest surprise of the awards was that we won the sauce category. Normally the only ancillary that we compete in is dessert, but when they were delivering our turn-in, boxes Tana Shupe gave me a sauce cup. I said, "well I guess I will turn in a sauce since you gave me a cup." I didn't think too much about it until about an hour before the sauce turn in. I just got in the trailer and made up a little concoction. I added a little of this and a little of that until I thought it tasted pretty good. We turned it in and proceeded to joke about how it would be funny if we won the sauce category. Well we won. Overall we finished 21 out of 43 teams. It is not where we wanted to be, but at least it was an improvement from Pulaski. We had a great time in Lawrenceburg and got to meet some new people. I was especially glad to meet Rub from Swamp Boys. Rub is a fellow Stumper and is actually a Stumps dealer in Florida. He also knows a thing or two about cooking...he is currently the number one team in the Florida Barbecue Association. Congrats on the third place finish, Rub (1st place chicken and 1st place brisket). We also met Kevin from The EGGseQuetive Council. 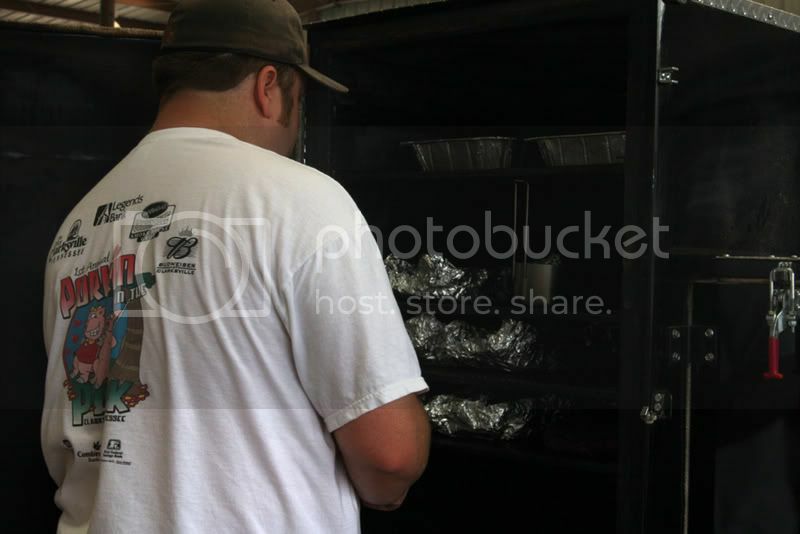 This is Kevin's first year competing on his own and had a strong fourth place finish with a 1st place pork. 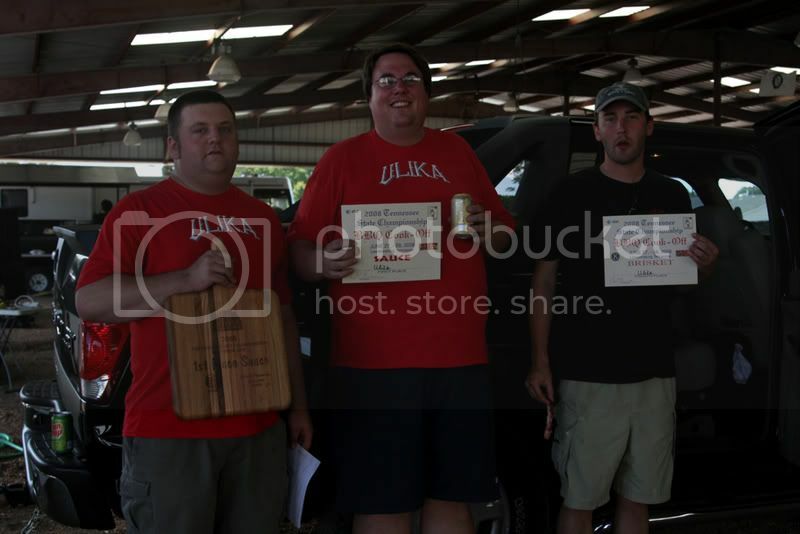 To no ones surprise, Byron Chism of Buttrub.com and Mike Davis of Lotta Bull took first and second overall. Well, now that the heat of the summer is upon us, we are taking a couple of months off. Our next scheduled competition is September 5-6 in Cookeville, TN. I am going to be judging the Lebanon, TN contest in August and I feel that should give me a little more insight to the other side of the table. 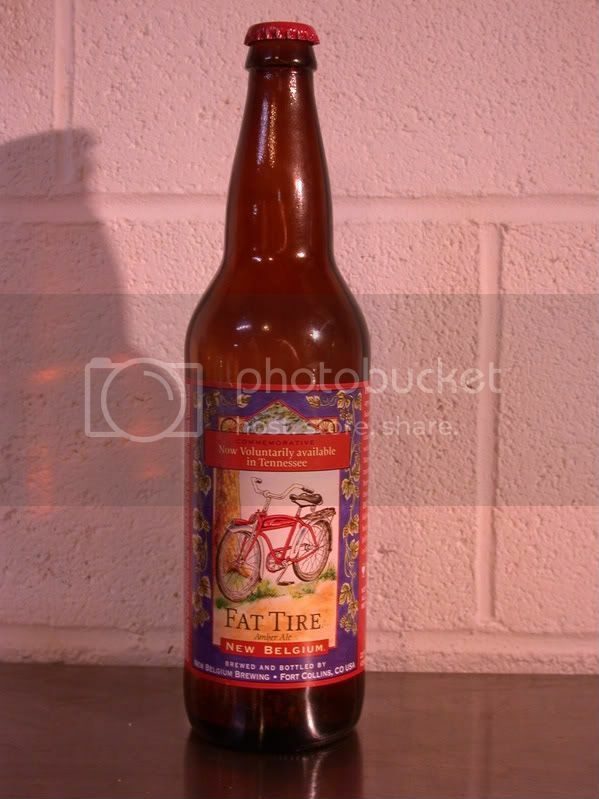 Fat Tire has finally arrived in Tennessee. They even put out some special commemorative labels that read, "Now Voluntarily Available in Tennessee". Get it? We are the volunteer state. Well this has been a long time coming, and I hope I don't get burned out on one of my favorite beers. I guess those emails eventually paid off.